I don’t have a lot of time for wars, I find them a waste of time, life and effort because, no matter who wins, nothing ever seems to really get resolved and when they’re over we just seem to sit around waiting for the next one. I do wholeheartedly support Anzac Day though, it’s a mark of respect for all those who gave their lives willingly (except maybe for some of the conscripts, but that’s a whole other matter entirely) fighting against whoever we’d taken a dislike to at the time. 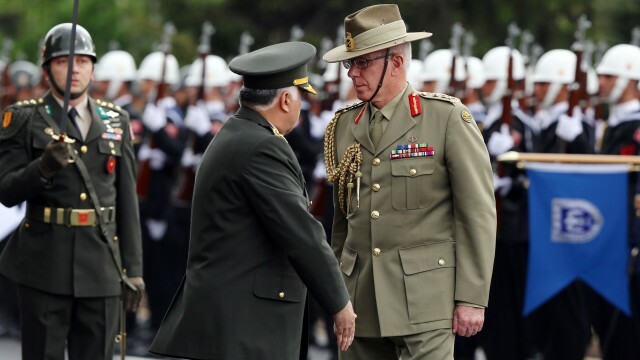 Anzac Day was initiated mainly to honour the fallen – which is a nice word for getting shot or blown up or bayonetted through the neck or whatever was popular at the time – in the first big one, WWI. Of course, when those who’d made it through that one were mainly all dead, it became extended to include anyone who’d ever died in any of the wars since, which, if you’ll cast your mind back over the last hundred or so years, have mainly involved the Germans. Occasionally the Japanese as well, and I’m referring here of course to the second big one, WWII, and a little incident that’s become known simply as Pearl Harbour. Naturally you can’t expect to get away with that sort of thing without consequences and, being a nation which clearly enjoyed surprises, we showed them what’s what in 1945 with a couple of big ones they weren’t expecting. Hitler was the worst though, but like many little jumped-up goose-steppers before him he let success go to his head and he saw himself as invincible. He was doing pretty well for a while there though, Poland, Czechoslovakia, most of Europe in fact – except for some of the high bits like Switzerland – and then in 1942 he started strutting about the place, telling people that not only was he going to invade Russia, he was going to do it in the winter. Success, as I said, had gone to his head and it became his downfall. I have fought in one war, Vietnam, when I was over there sorting things out for Dicky Nixon. I didn’t like it. I don’t think it was a particularly nice war. There was one man in our regiment, Corporal Watkins, not a nice sort of chap at all. I didn’t like him. No respect for the enemy, which isn’t a good attitude. He used to get up to the most atrocious behaviour. What he started doing was, he’d shoot an enemy and then cut off his head and wear it as a hat. Not on. Not on at all. The thing was, they would never stay on, kept falling off, so he started carrying around a strap which he’d put under his chin and hook over the hat’s ears. I suppose it does display a kind of resourcefulness, but that sort of stuff is just another instance why I don’t like war, it just encourages bad behaviour. But however horrible and pointless and wasteful war is, we have to show respect for those who don’t make it through, and we’ve been given Anzac Day just for that purpose. Of course you can’t keep up respecting people for three whole days nonstop over a long weekend, it’s debilitatingly taxing and we’re not designed to do it, so we take a minute when everyone shuts up for the count of sixty and thinks about all the dead people from all the wars in which they’ve most bravely fought. And then it’s back to the two-up and the drinking which, over time, good or bad, has become a traditional part and parcel of the whole occasion. Happy Anzac Day everyone, and rest assured it’s a holiday that’s not going away any time soon.